Figure 1. Treatment of NIH/3T3 cells with PDGF (A) or TNF-α/IL-1β (B) induces differential phosphorylation of p44/42 MAPK at Thr202/Tyr204, MEK1 at S217/221, p38α MAPK at Thr180/Tyr182, and SAPK/JNK at Thr183/Tyr185 as detected by the PathScan® MAP Kinase Multi-Target Sandwich ELISA Kit #7274. 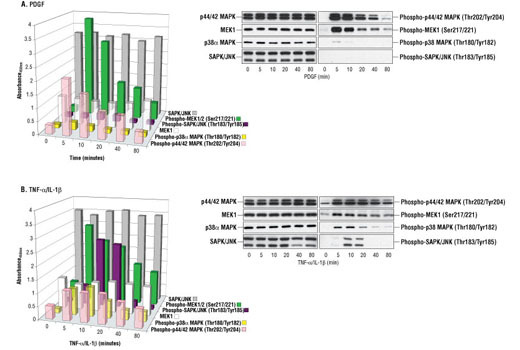 While dynamic phosphorylation is observed throughout the time course, the level of total p44/42 MAPK, MEK1, p38 MAPK and SAPK/JNK remains unchanged as demonstrated by sandwich ELISA and Western analysis. NIH/3T3 cells (80-90% confluent) were starved overnight and stimulated with PDGF (100 ng/mL) for 5, 10, 20, 40 and 80 minutes at 37ºC. For simultaneous treatment with TNF-α and IL-1β, exponentially growing cultures of NIH/3T3 (80-90% confluent) were treated for the indicated times at 37ºC with 20 ng/mL TNF-α and 10 ng/mL IL-1β. Lysates were assayed at a protein concentration of 0.5 mg/mL. The absorbance readings at 450 nm are shown as a 3-dimensional representation in the left figure, while the corresponding Western blots are shown in the right figure. The antibodies used for the Western analyses include p44/42 MAP Kinase Antibody #9102, Phospho-p44/42 MAPK (Thr202/Tyr204) (E10) Mouse mAb #9106, MEK1 (61B12) Mouse mAb #2352, Phospho-MEK1/2 (Ser217/221) Antibody #9121, p38α MAP Kinase Antibody #9218, Phospho-p38 MAPK (Thr180/Tyr182) (28B10) Mouse mAb #9216, SAPK/JNK (56G8) Rabbit mAb #9258 and Phospho-SAPK/JNK (Thr183/Tyr185) (G9) Mouse mAb #9255. Figure 2. Schematic representation of a 96-well plate depicting the color-code of the reagents used to detect endogenous levels of phospho-p44/42 MAPK (Thr202/Tyr204) (light pink; 1 & 2), Phospho-p38 (Thr180/Tyr182) (yellow; 3 & 4), MEK1 (white; 5 & 6), Phospho-MEK1 (Ser217/221) (green; 7 & 8), SAPK/JNK (gray; 9 & 10) and Phospho-SAPK/JNK (Thr183/Tyr185) (purple; 11 & 12). CST's PathScan® MAP Kinase Multi-Target Sandwich ELISA Kit is a solid phase sandwich enzyme-linked immunosorbent assay (ELISA) that combines the reagents necessary to detect endogenous levels of phospho-p44/42 MAPK (Thr202/Tyr204), phospho-p38 MAPK (Thr180/Tyr182), MEK1, phospho-MEK1 (Ser217/221), SAPK/JNK and phospho-SAPK/JNK (Thr183/Tyr185). These molecules represent convergence points and key regulatory proteins in signaling pathways controlling cellular events such as growth, differentiation and the response to stress and inflammation. Sixteen tests are provided for each target protein. Specific assay formulations for the indicated target proteins can be found in the datasheets associated with the individual PathScan® Sandwich ELISA Kits**. Briefly, a capture antibody has been coated onto the microwells. After incubation with cell lysates, the target protein is captured by the coated antibody. Following extensive washing, a detection antibody is added to detect the captured target protein. An HRP-linked secondary antibody is then used to recognize the bound detection antibody. HRP substrate, TMB, is added to develop color. The magnitude of absorbance for this developed color is proportional to the quantity of bound target protein. *Antibodies in kit are custom formulations specific to kit. **See companion products. CST's PathScan® MAP Kinase Multi-Target Sandwich ELISA Kit #7274 detects endogenous levels of six proteins: phospho-p44/42 MAPK (Thr202/Tyr204), phospho-p38 MAPK (Thr180/Tyr182), MEK1, phospho-MEK1 (Ser217/221), SAPK/JNK and phospho-SAPK/JNK (Thr183/Tyr185). Differential phosphorylation of these proteins can be observed over time in response to various growth factor and cytokine treatments, as shown in Figure 1. The relationship between the protein concentration of the lysate and the absorbance at 450 nm can be found in the datasheets associated with the individual PathScan® Sandwich ELISA Kits**. **See companion products. Both p44 and p42 MAP kinases (Erk1 and Erk2) function in a protein kinase cascade that plays a critical role in the regulation of cell growth and differentiation (1-6). MAP kinases are activated by a wide variety of extracellular signals including growth and neurotrophic factors, cytokines, hormones and neurotransmitters. Activation of MAP kinases occurs through phosphorylation of threonine and tyrosine (Thr202 and Tyrr204 of human MAP kinase or Thr183 and Tyr185 of rat MAP kinase) at the sequence T*EY* by a single upstream MAP kinase kinase (MEK) (7,8). MEK1 and MEK2 are dual-specificity protein kinases that function in a mitogen activated protein kinase cascade controlling cell growth and differentiation. Activation of MEK1 and MEK2 occurs through phosphorylation of Ser217 and Ser221 by Raf-like molecules. 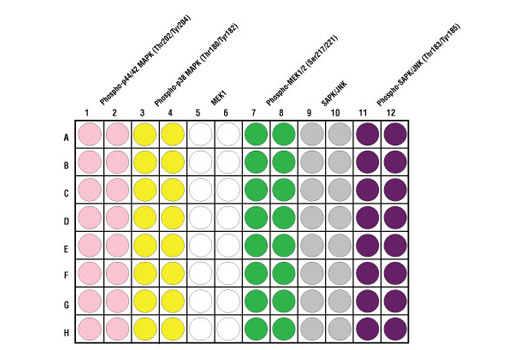 MEK activates p44 and p42 MAP kinase (1,9,10). The stress-activated protein kinase/Jun-amino-terminal kinase SAPK/JNK is activated by a variety of environmental stresses, including UV and gamma radiation, ceramides, inflammatory cytokines and in some instances, by growth factors and GPCR agonists (15-20). As with the other MAPKs, the core-signaling unit is composed of a MAPKKK, typically MEKK1-4, or by a mixed lineage kinase (MLK), which phosphorylates and activates MKK4-7, which then phosphorylates Thr183 and Tyr185 to activate the SAPK/JNK kinase (16). Stress signals are delivered to this cascade by small GTPases of the Rho family (Rac, Rho, cdc42) (17). Both Rac1 and cdc42 mediate the stimulation of MEKKs and MLKs (17). Alternatively, MKK4-7 can be activated by a pathway independent of small GTPases via stimulation of a member of the germinal center kinase (GCK) family (18). Marshall, C.J. (1995) Cell 80, 179-85. Hunter, T. (1995) Cell 80, 225-36. Whitmarsh, A.J. and Davis, R.J. (1998) Trends Biochem Sci 23, 481-5. Hill, C.S. and Treisman, R. (1995) Cell 80, 199-211. Cowley, S. et al. (1994) Cell 77, 841-52. Sturgill, T.W. et al. (1988) Nature 334, 715-8. Payne, D.M. et al. (1991) EMBO J 10, 885-92.